Many people believe how Antarctica is the only continent that isn't affected with global warming. Most of them connect global warming only with Arctic and polar bears but this is sadly far away from the truth. 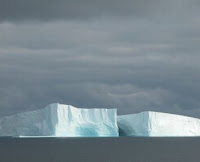 Latest satellite data from the European Space Agency (ESA) revealed that an estimated 700 square kilometres of the Antarctica's Wilkins Ice Shelf have been lost, with satellite data last week showing the first icebergs had started to calve off its northern front. Not so long ago there was also one big loss of ice in Antarctica when the ice bridge between the Antarctic mainland and Charcot Island collapsed, resulting in loss of ice at around 330 square kilometres. Scientists also warned how eight separate ice shelves along the Antarctic Peninsula have shown signs of retreat over the last few decades, with Wilkins Ice Shelf being the largest of its kind. There is almost no doubt whatsoever that this ice retreat in Antarctica is the result of climate change, and result of atmospheric warming on the Antarctic Peninsula. This trend is likely to continue in years to come because ice will react more and more to increased temperatures, and we are likely to see even bigger ice loss in years to come. This loss of ice is really no surprise when you look at the data showing that Antarctica has experienced warming of 2.5C in the past 50 years. The only good news in this whole story is that the loss of this ice will not cause a rise in sea levels, because it is already floating. However this is the clear evidence of climate change in Antarctica because The Wilkins Ice Shelf had been stable until the 1990s when it began to retreat at a pace even quicker than scientists have expected.